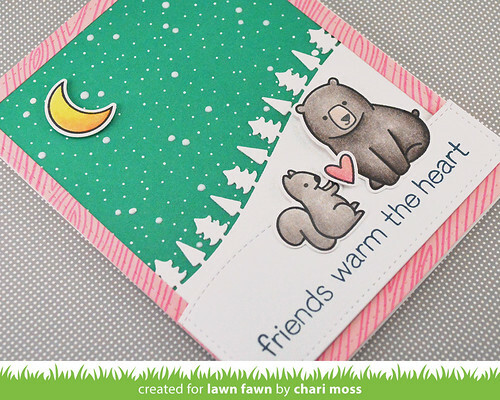 This week the Lawn Fawn design team is playing along with Tsukineko and Imagine Crafts. They were so generous and sent us lots of fun goodies to play with! Memento Tuxedo Black is by far my go to ink, I use it all the time. On this card I used the Memento Tuxedo Black to stamp out my images and then I colored them with colored pencils blended with gamsol. The snowy hill with the trees is covered in a coating of Sheer Shimmer Spritz in Frost. It's a little hard to see in the photographs but it has a beautiful sheen in real life. I stamped the sentiment with Memento Luxe pigment ink in Nautical Blue. The frame is cut using the Stitched Rectangle stackable and stamped with woodgrain backdrops in Radiant Neon pigment ink in Electric Pink. 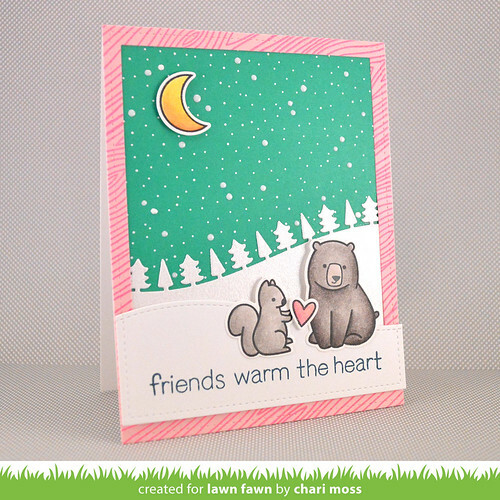 And finally I used the irRESISTible Pico Embellisher in White to add some snow embellishments to the sky background. Beautiful card! I use Tsukineko ink, my favorite ink for Copic and pencils is Memento Tuxedo Black too. Such inspiration here. Fabulous card! I love your sweet winter card and I wish to case it. Doesn't get much cuter than this! Such a cute scene...adorable images. I know I have already commented but I wanted to let you know I made 6 cards casing you. I will post in a few days and give you ful credit and a link to your fun, inspiring blog.